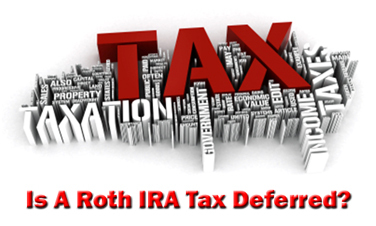 Is A Roth IRA Tax Deferred? That's a great question, and one you need to know the answer to in order to choose the right retirement savings vehicle. Because most retirement accounts, such as a 401k and a Traditional IRA, offer tax-deferred contributions and tax-deferred growth of your investments. So if you're pulling your hair trying to figure out where you should allocate your retirement savings - your 401k, your Roth IRA, your Traditional IRA, or some other alternative - then you need to take tax deferral into account. Because tax deductible contributions and tax-deferred capital gains can save you thousands and thousands of dollars over the course of 20 or 30 years. And you like saving thousands of dollars, right? So let's see how your Roth IRA stacks up when it comes to tax deferred savings. Unlike a 401k or a Traditional IRA, contribution to your Roth IRA are NOT tax deductible. That means your Roth IRA contributions must be made with after-tax dollars. So how does that effect your bottom line? Well, if you max out your annual contribution to a Traditional IRA instead of a Roth IRA, you save more money in income taxes in the present year. Because Traditional IRA contributions are tax deductible, while Roth IRA contributions are not. Let's say you're 30 years old and your adjustable gross income (AGI) is $60,000. Your current income tax rate is 35%. If you make the maximum contribution of $5,000 to your Traditional IRA, you can deduct that contribution from your AGI before paying income taxes. This means you only pay taxes on $55,000 instead of $60,000. So after paying a 35% tax bill, you end up with $35,750 in your pocket and $5,000 in your Traditional IRA. Let's say you decide to max out your Roth IRA instead. In making a $5,000 contribution to your Roth IRA, you can NOT deduct the contribution amount from your taxable income. So you still pay a 35% income tax rate on the full amount of $60,000. After paying that 35% tax bill, you end up with $34,000 in your pocket and $5,000 in your Traditional IRA. So, in this instance, maxing out your Traditional IRA offers $1,750 worth of tax savings in the present year. So does that mean maxing out your Traditional IRA is a better deal than maxing out your Roth IRA? It always depends of your personal financial situation and what's right for you. But don't allow yourself to be blinded by the big tax savings you get in the present year from your tax deductible Traditional IRA. Withdrawals from your Roth IRA are tax-free after age 59 ½. So your Traditional IRA may not be the better deal after all. Let's assume the same numbers from earlier. In the first scenario, you max out your Traditional IRA and end up with $35,750 and a $5,000 IRA balance. In the second scenario, you max out your Roth IRA and end up with $34,000 and a $5,000 Roth IRA balance. Now, let's say you're able to grow that $5,000 balance 6% per year for 30 years. But if you maxed out your Traditional IRA, the entire $28,717.45 remains subject to income tax. That's a difference of $10,051.11...! Even though you saved $1,750 in taxes when you maxed out your Traditional IRA, your Roth IRA more than makes up for that with tax free withdrawals in retirement. So make sure you do your homework before jumping to conclusions over tax deferred contributions vs. non-tax deferred contributions. Just as contributions to your Traditional IRA or 401k are tax deductible, and thus, tax deferred... The earnings and investment gains in those accounts grow free of capital gains taxes and income taxes until retirement. At age 59 ½, you can withdraw those funds subject to income tax. So with your Traditional IRA or 401k, taxes of your investment gains are deferred until a later date. But is your Roth IRA tax deferred as well? It's actually not. Even though your Roth IRA earnings and investment gains grow free of capital gains and income taxes just like a 401k or a Traditional IRA, you can't say they're tax deferred. Because the phrase tax deferred implies you still owe taxes sometime in the future... That while you don't pay taxes now, you can expect to sometime in the future. So instead of saying your Roth IRA is tax deferred, it makes more sense to say your Roth IRA is tax free. Because once you fund your Roth IRA with a non-tax deductible contribution, you never pay taxes again! Since you paid income taxes on your initial Roth IRA contribution, you don't ever have to pay taxes again (assuming you follow the 5 year rule and wait until age 59 ½ to withdraw funds). Your investment grows free of capital gains taxes and income taxes, and when you withdraw those gains in retirement, you don't owe any taxes on them. That's sounds like a great deal, right? Still find the concept hard to follow? Let's say you're 30 years old. You earn $70,000 per year, and your income tax rate is 30%. You decide to divide your $5,500 maximum annual IRA contribution between a traditional account and a Roth. So, you contribute $2,500 to your Traditional IRA and $2,500 to your Roth IRA. Your $2,750 Traditional IRA contribution is tax deductible, so your taxable income drops to $67,250. You then pay a 30% income tax rate on that income, leaving $47,075 in your pocket. From that after-tax income, you fund your Roth IRA to the tune of $2,750, leaving you with $44,325. Under IRS rules, both your Traditional IRA and your Roth IRA investments grow free of capital gains taxes and income taxes as you wait to reach age 59 ½. How much do you end up with? But is that really what you get? $20,933.70 in your Roth IRA, but only $14,653.59 in your Traditional IRA. That's the difference between an IRA that's tax deferred and an IRA that's tax free. So is a Roth IRA tax deferred? Why do I say technically? Because a Roth IRA may not offer you tax deferred savings, but what it does offer is far better. So while you might save a few bucks in the current tax year by making a tax deductible contribution to your Traditional IRA or 401k, you can save thousands in the long run when you're able to make tax-free withdrawals from your Roth IRA! And while your Roth IRA, 401k, and Traditional IRA all allow you to grow your investments free of capital gains taxes and income taxes, those taxes are deferred for your 401k and your Traditional IRA. But they aren't deferred for your Roth IRA, because the word deferred implies the tax liability is sometime in the future, and with a Roth IRA, you have no future tax liability. You fund your Roth IRA, and then you never pay taxes again! Return to the top of Is A Roth IRA Tax Deferred?